I dislike glittery sparkly paint, but we have a new baby and I am worn down from lack of sleep, so today our 3-year-old won and we covered our table (and a few popsicle sticks) with paint. Once Valentine's Day passes I am always chomping at the bit to start celebrating the next holiday. 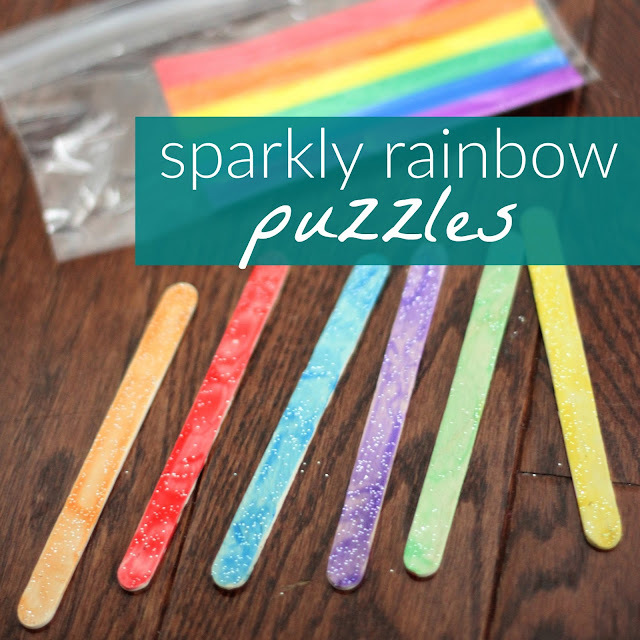 Since St. Patrick's Day still feels kind of far away, we're diving into some rainbow crafts before we start on shamrocks. 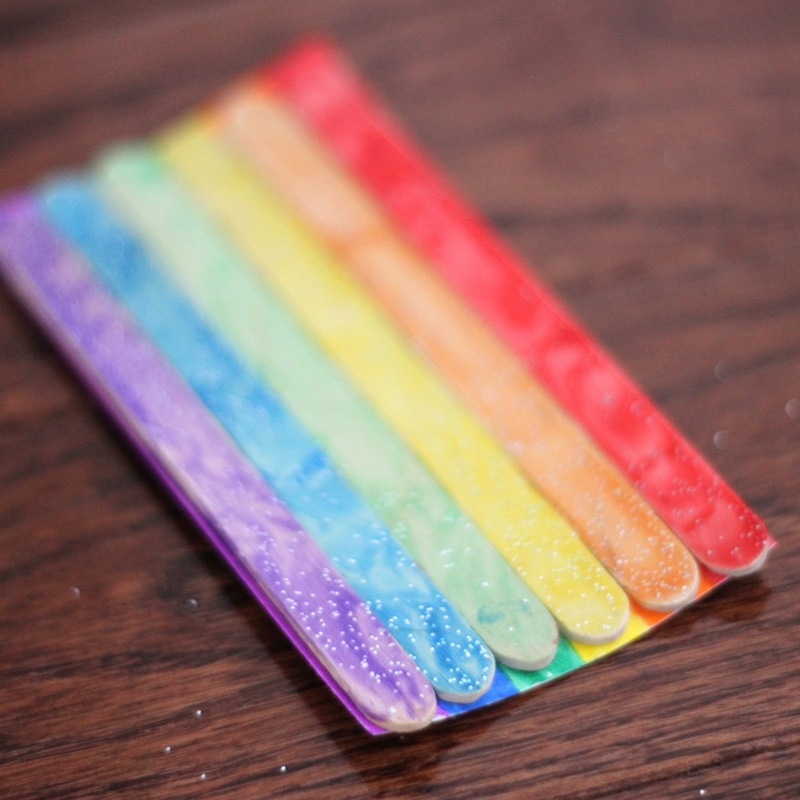 Yesterday we gathered some popsicle sticks and sparkly paint to make some rainbow puzzles. 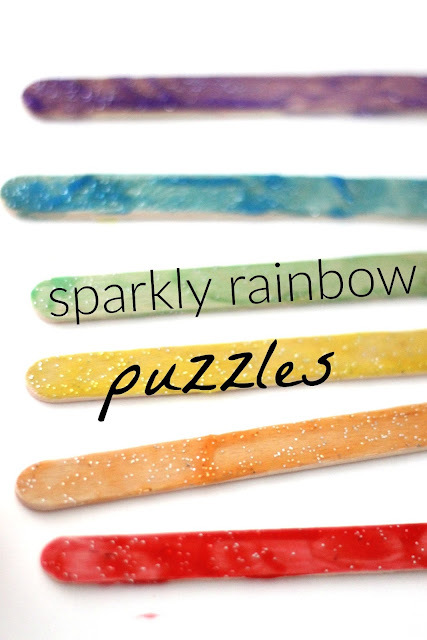 *We used some fun paint that our friends at craftprojectideas.com sent to us to try out. To get started we painted several popsicle sticks the colors of the rainbow. 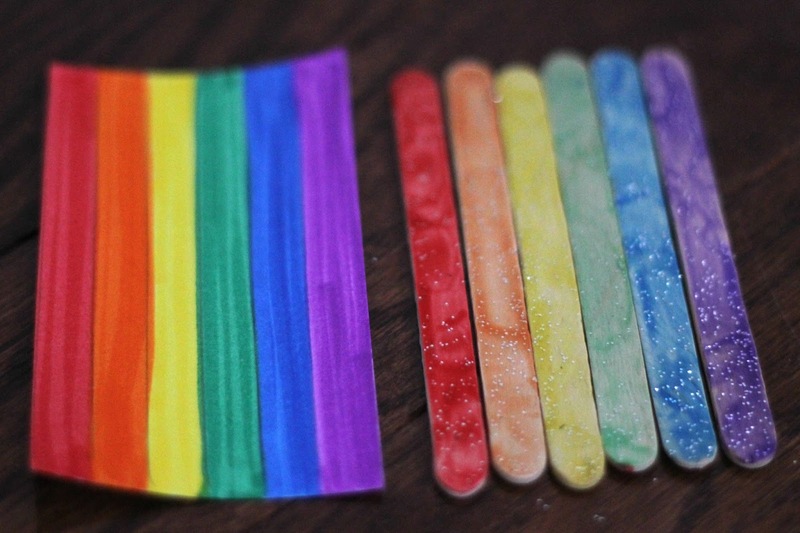 Next we cut and colored a piece of cardstock to match the size and colors of the popsicle stick rainbow. 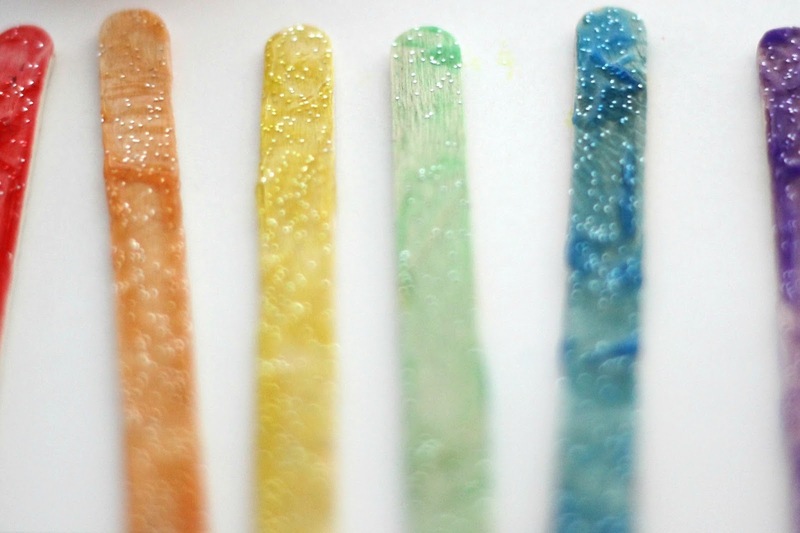 Then we stuck the popsicle stick rainbow and paper rainbow inside a ziploc baggie and dropped into my purse to take on the go. 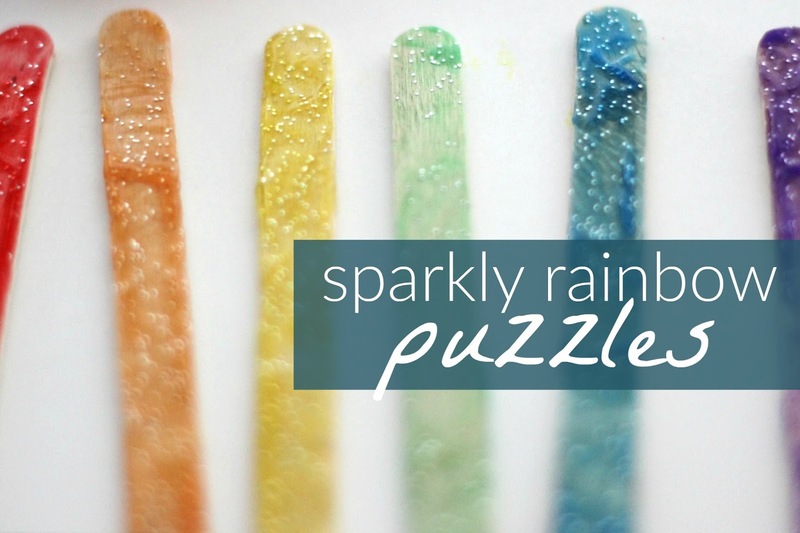 This easy popsicle stick puzzle can be pulled out and put together at a restaurant or doctor's office... or just at home. The puzzle occasionally drops a few sparkles too (which my son loves). I may add some velcro to make it even more fun. With a new baby (just over 1 month old), a toddler, a preschooler, and an 8-year-old to wrangle by myself at church each Sunday, I am looking to pull together several simple busy bags to keep the toddler and preschooler occupied. This simple rainbow puzzle is quick to make and doesn't require much effort. How do you like to keep your kiddos occupied at appointments or waiting places? Have you made any busy bags? Do you like glitter and paint? 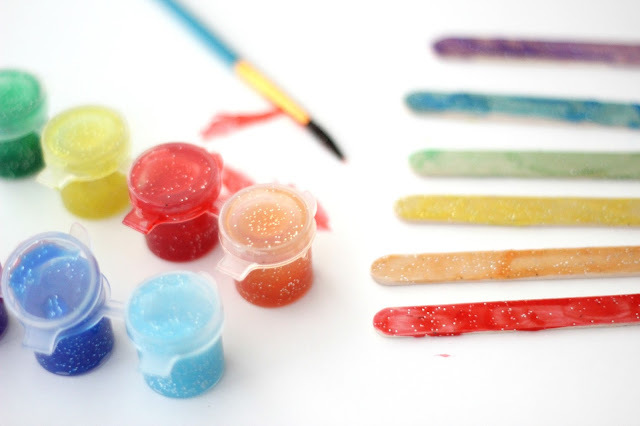 Or do you shy away from messy crafts? Check out more busy bag ideas HERE.